You may have been reading about the proposed closure of Huntstown power station in Dublin (my business partner Fergus used to work there). This was because Huntstown failed to secure capacity (read active standby) payments at the right price for the plant. The auction cleared at 41,800.00€/MW. Alongside an application for a 100MW battery we think this may be an important signal for the future of the grid in Ireland and the pivot towards a renewable grid. 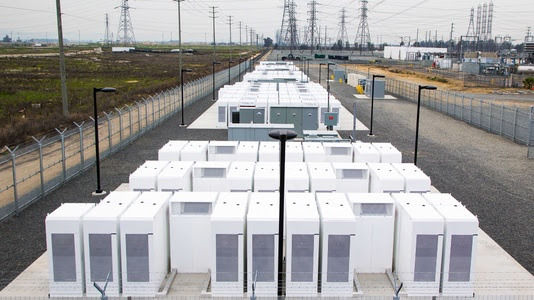 I am sure many of you have also read about Elon Musk when he promised Tesla could build and install a 129 megawatt-hour grid storage battery in South Australia in 100 days or less. If Tesla failed to meet the deadline, the battery would be free. In fact, Tesla beat its own deadline, weeks ahead of schedule. This now actually looks like it set an important precedent paving the way for other battery storage projects worldwide. Recently, the battery was praised with averting a major grid incident after a coal power station tripped suddenly. Last week the company (Neoen) operating the battery was reported to have made about $1 million in 2 days, which has been a serious wakeup call to detractors who had assumed that the Tesla battery was just a Elon Musk publicity stunt with little financial return. In Ireland, a company called Greener Ideas Limited has proposed a 100 megawatt Battery Energy Storage System plant at the IDA Park, Purcellsinch, Kilkenny. If approved, this will be the largest battery to date in Europe. This has important implications for more wind power integration into the Irish grid – already among the highest in the world with another new record this January . How does a grid battery work? Batteries do not work by supplying power to the grid as a substitute for say a coal plant when needed as 100MW would only work for a few minutes. The way it works is quite complex, but I will try to simplify it here. The principal cost benefit of battery storage is not so much the price of the battery as it is the savings realized from not building and operating so-called “peaker” plants that operate only a few hours a day. Even though its only 100 MW, (mid-day the Irish grid runs around 5000 MW) it has an outsize effect on stability. It counteracts the tendency of the system to destabilize and go out of frequency or voltage range. Other resources can respond later, but the instant surge from a battery helps when the other sources take too long to respond. Keeping the grid stable means matching supply and demand at all times. If a powerplant ‘trips’ due to a sudden unexpected fault it causes an immediate shortfall in energy and this can cause the frequency of the system to drop. If this drop is not arrested & reversed quickly, then the whole system can crash leading to widespread power failure. Last time this happen in Ireland was in the 1950s….a testament to how well managed the Irish grid is but is more common in places like Australia. Without getting into the reasons why here – as the amount of wind on the grid increases this problem becomes harder to manage. One of the ways the grid operators currently manage this risk is to combine windpower with gas turbines running in the background. Effectively a large numbers of these turbines have to be running at a low level in the background so if there is a fault they can respond automatically and immediately to push the frequency back up. This is called inertial response. However, when operating in this low output modulation type mode the gas turbines are very inefficient. As you introduce more wind and solar, gas turbines become so inefficient as to be as polluting as coal (there are Eirgird studies on this). This is where batteries come in. By responding fast & aggressively to faults, batteries reduce the need for the gas turbine inertial response back up. A recent study at Queens University Belfast study suggested that 360MW of batteries can provide an equivalent inertial response to 3000MW of gas turbine generation. (note inertial response not power equivalent). The work at Queen’s is very interesting as they base a lot of their data off a 10MW battery energy storage system at Kilroot power station, N.Ireland. Thanks to progressive grid policy by Eirgrid and SONI (N.Ire), Ireland is a world leader in wind penetration and now we are moving to the next level, by addressing the challenge of providing clean inertial response with batteries. Some of you might be aware of the Demand Side Schemes. The new DS3 scheme which could have potentially been a source of income for sites with generators are now very onerous in terms of data collection and transmission and all but rule out everybody except a handful of the biggest industrial sites in Ireland.Existing DSU participants will be facing reduced payments unless a remote/automatic start facility is provided. We would guess that the success of the Australian Tesla battery was a factor in the decision to keep this scheme confined to a small number of select sites. Oil prices have been climbing hard recently – West Texas Intermediate (WTI) is above $65 a barrel while Brent crude is breaching $70 a barrel for the first time since December 2014. But, the USA has been bringing new oil wells on-line at speed as we expected given the increase in prices. Wellhead prices, the oil exchange at which the producer makes its money – are now in the range of the low $50s. At this point, most U.S. producers can run a profit. With the current ramp up, the USA should over take Saudi Arabia pretty soon as the second largest oil producer in the world and may even over take Russia as No.1. The SMP price in Jan was 5.36 c/kWh a decrease from the Dec price of 5.77 c/kWh due to high wind levels in Jan (new records achieved thanks to all of those storms) and sluggish gas prices.